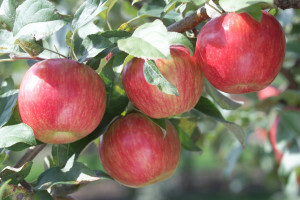 Nearly 100 years ago, Charles Haralson, superintendent of the University of Minnesota’s Fruit Breeding Farm, developed a crisp, juicy, slightly tart apple. The Haralson, along with the Beacon, Fireside, and Regent, grew into mainstays for apple growers. But by the late 20th century, the U.S. apple industry was in a funk, depressed by low-cost apple imports that dominated market share but failed to excite apple lovers. [i] The Better World Project, Association of University Technology Managers. (2006.) Technology Transfer Works: 100 Cases From Research to Realization. Page 11. [iv] University of Minnesota. (June 2013.) Vineyards and Wineries in Minnesota: A Status and Economic Contribution Report, by Brigid Tuck and William Gartner. Page 2.